"...you really kept the party going. Thank you for keeping my guests entertained and happy!" "Our event was a great success and we thank you for coming on such short notice and doing such a fine job. We raised over $9,000 for the Orange County Rescue Mission"
"You helped make the best day of our lives very special. Your help meant a lot to us and was greatly appreciated." Unforgettable Entertainment's disc jockeys are skilled entertainers, who with your input, will determine the best music to suit your event. Our music repertoire includes selections from around the world - salsa, polka, tarantella and more - and group dance favorites, such as the Hokey Pokey, Chicken Dance and Electric Slide. Unforgettable Entertainment also offers karaoke and live-band services. Our musicians play the sounds of Big Band, swing, jazz and oldies. You can contract a three to 17-piece band for your event. Unforgettable Entertainment's commitment to client fulfillment sets it apart from other companies. We strive to surpass your expectations - not merely satisfy them. For example, we work with other vendors, such as wedding coordinators, photographers and videographers, to make events run smoothly. In addition, Unforgettable Entertainment's disc jockeys and musicians have worked at the area's most popular venues," so they are familiar with each establishment's layout, logistics and requirements. Unforgettable Entertainment's disc jockeys and musicians have performed at events across the Southland, held at a range of fine banquet facilities, restaurants, museums, hotels and more. We have also performed at corporate events for El Torito, Marie Callender's, Costco and The Anaheim Ducks. Unforgettable Entertainment views each client as its most-important asset. Therefore, we do not have a standard price list. Because every event is unique, Unforgettable Entertainment creates customized solutions based on your needs. Gregg Shinedling, owner, studied Theater and Communications at Fullerton College and earned a certificate in Radio Broadcasting from the Academy of Radio Broadcasting in 1993. He has worked as a professional disc jockey since that time. We screen our disc jockeys to ensure they meet Unforgettable Entertainment's high standards of professionalism and technical expertise. The ADJA (American Disc Jockey Association) is an organization of professional mobile entertainers. The mission of the American Disc Jockey Association is to encourage success for its members through continuous education, camaraderie, and networking. We believe that through involvement in this professional organization, DJ's achieve more as a group than they can individually. The American Disc Jockey Association is an organization of professional Disc Jockeys. 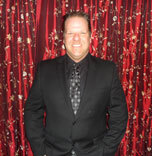 Chris has been working for Unforgettable Entertainment for over 8 years now and has DJ'd 100s of events. He is familiar with many Southern California venues including the Queen Mary, The Ritz Carlton and The Nixon Library. He DJ's all types of events from birthday parties to school dances and weddings. 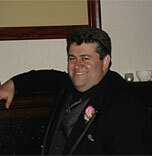 His professional personality will make sure your event runs smoothly. One of Chris's greatest attributes is his music library. His music library is one of the best we've seen. Whether it is Big Band, Classic Rock, or New Wave it is hard to stump him and ask for a song he doesn't have. I have had the pleasure of knowing Adam most of my life and now have the pleasure of getting to work with him. ADAM has been learning and building his talents as a DJ since 1995. He has one of the greatest personalities I know and his knowledge of music makes him an amazing DJ. In Addition to DJing Adam has had an extensive background in musical theater, S.P.E.B.S.Q.S.A., & The Young Americans. Performing many venues dating back even since children's theater. 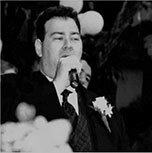 ADAM is an award winning vocalist, who has competed in many competitions and can also offer live vocals for ceremonies, first dances, and many other types of events in addition to his DJing. Eric is one of my closest friends and I now have the pleasure of being able to work with him. He has an amazing and friendly personality, your guests will love him. He has been in the business for a few years and specializes in more mature groups Such as 40, 50, even 60 year old birthday parties and anniversary parties. He has recently upgraded to a digital system and his music library consists of over 80,000 songs including about 2,000 for Karaoke. I have known Jake for many years now and was Finally able to convince him to come and work at Unforgettable Entertainment. Because Jake is my newest DJ he is also my most affordable. He has DJed many events across Southern California and has gotten lots of positive feedback. His system is a combination computer and CD system and his music library is about 35,000 songs which gets updated regularly so he always has the newest music that is available.